General: That priests who experience difficulties may find comfort in their suffering, support in their doubts, and confirmation in their fidelity. Mission: That as fruit of the continental mission, Latin American Churches may send missionaries to other churches. More to come as I find them. Remember death ... Come forth! 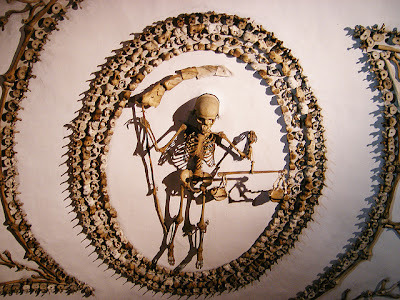 Today being Halloween, I thought it would be fitting to visit the church of Santa Maria della Concezione dei Cappuccini, perhaps more commonly known simply as "the bone church" because of the uniqueness of what is found there. When first you enter the crypt, you cannot help but feel a bit creeped out by the artistic arrangement of bones, but the longer you contemplate what is before you the more beautiful it becomes. The arrangement of the bones was completed by 1775, when we find the first known mention of it, though when the arrangement was done or by whom it was is uncertain. The decoration of this crypt is nothing less than a reminder to each of us that we, too, will die. Indeed, every cemetery also serves this very purpose, in addition to providing a fitting resting place for the dead. It is not a bad remember for each of us and is partly why Saint Francis of Assisi - and so many others - spent countless hours of their lives contemplating death. The poor man of Assisi once prayed, "Grant that we may be ready to die for love of your love, as you died for love of our love." As I walked among those bones, I recalled the words of Saint Damien of Moloka'i, the Leper Priest: "
We must all die ... So let us begin from this day to prepare for a happy death. Let us not lose a moment of the little time we still have to live." Paradoxically, when we remember death we remember life, we remember the life we are called to live. For some, this can lead to despair, as they recognize how often and how greatly they have failed to love both God and neighbor, but it need not be so. Remembering death, we cannot also but remember the death that the Son of God died for us, and remembering the depth of his love we can experience anew the mercy he longs to bestow upon us. The crypt is composed of several adjacent rooms, connected by a common hallway. Before leaving the crypt area you pass by an altar at which the Holy Mass is offered for the deceased, above which is a depiction of the raising of Lazarus from the dead. This crypt is then not a morbid display of what will become of each of us, but is rather a monument to the glory of the coming resurrection of the dead, when those bones made to decorate sacred ground will be reunited and - we pray - walk in the presence of God. To each of those bones, the Lord Jesus will command, "Come forth" (John 11:43)! Those same words, we, too, will hear when at last he comes. To remember death is to contemplate eternity and the glory to which we are called. This, in the end, is what the celebration of Halloween is about. It is - in many ways - a mockery of death, because we know that death has been defeated. We, too, mock with Saint Paul: "Death is swallowed up in victory. Where, O death, is your victory? Where, O death, is your sting" (I Corinthians 15:54-55)? We see this in tomorrow's celebration of All Saints and the next day's celebration of All Souls; on the first, we celebrate that which we are all called to be, and on the second we pray for those who have died in friendship with God though not yet perfected. I've got a friend who is undecided about what religion he wants to be and tomorrow I'm bringing him his FIRST EVER Catholic mass [sic]. I hope this inspires him to love and come to know Christ! As you might expect, many of us were only to happy to join our prayers to hers. Why did he accept her invitation? Because she loves the Catholic faith, has embraced it, and is not afraid to share it with others. Remember my post about the new kid at mass [sic]? Well today I got a text that read: "Hey, so Church was super cool... Catholicism... I wanna know more." The Holy Father Pope Francis keeps calling us out to the peripheries to bring the love of Jesus Christ to others; sometimes the periphery isn't so far away. This particular Christian, a high school student, reached out to her friend and her invitation was accepted. Who will you invite to accompany you to the Holy Mass? Who will you speak to of the love of Jesus Christ? Who will you help learn more about the Faith? The proclamation of the Gospel is a duty incumbent on every member of the baptized, not just for priests, deacons, and nuns. When I was a parochial vicar, I taught in the parish high school and frequently had students tell me variations of this line: "I have ADD; I can't pay attention very long." "Rubbish," I said to them. "I see you at basketball games and you do just fine there. I know you go to the movies without problems, and I'm sure you don't mind sitting for several hours through a baseball game." Naturally, they could not dispute any of this. When it came to it, I said to them: "The issue is not that you have ADD, but that you have little self-discipline. You can - and do - pay attention well, when you want to." One day - this is my particular favorite - one my students protested, "I was diagnosed yesterday with ADHD; it's not my fault!" I looked right at her and said, "You've been in this class for two months now and never once have you said a word. Every day you come in, sit down, close your eyes and fold your arms. You don't even move. I've never seen any sign of activity in you, much less hyperactivity; I'd find a new doctor." She did not protest and everyone in the class knew I was right. When I was in high school I did not pay much attention in class, simply because I was bored (out of my mind). Unlike most of my classmates, I did my homework at home and read the assignments before class and so already knew the material that was being covered in class. So, in most classes, I simply read a book. The teachers would call on me from time to time, I would give the correct answer, and then return to my book. We had an understanding, they and I. I knew they couldn't raise the standards of the classroom to teach more specifically to me and they knew that if they left me alone I would cause no disturbance or distraction. When I was teaching, I had one student who really lacked the discipline to sit still for more than five minutes at a time (anywhere); he was a very active young man and many of the teachers had a difficult time with him. I understood him, and told him he could pace back and forth at the back of the classroom, so long as he paid attention and participated in class. He found it helpful and didn't disturb my class, as he did in those where he forced to remain in the chair at a desk (I don't like staying at a desk for more than 30 minutes at a time, either, and often take brief wander breaks to refocus, but I can stay in a comfortable chair with a good book for hours on end. It's really a matter of preference. Even when studying today, I tend to switch topics or books every 20-30 minutes. I can sit still with the best with of them, but I still need to switch things around from time to time. Even for leisure, I'm never reading only one book at a time, but I always have a small stack of books to choose from. My classmates in the seminary were frequently frustrated with me because I would be curled up in a comfortable chair in my room reading a dense theological book for class, while watching The Lord of the Rings and visiting with those who walked by my room (the door was usually open), and I always knew what was going on in each of these. Others can't do that; I can. The notion of studying without music is appalling to me, though I know that others can't study with music. It's a matter of preference. Why am I writing about this today? Because Matt Walsh, whose blog I am following with greater interest with each post, suggested yesterday that ADHD isn't really the problem - or perhaps even real - but that perhaps instead "people are all, like, different." I couldn't agree more. Seriously, think about it. What if there ISN’T actually some preordained mold of behavior and thought in which we’re all supposed to fit? What if it’s OK for some people to be a certain way, while others are another way, and still others are an entirely different way? What if some people are active, and some people aren’t; some people are creative, and some people aren’t; some people have a lot of energy, and some people don’t; some people are daydreamers, and some people aren’t? What if — again, HUGE if — but what if we tried to find a place for the unique qualities of all men and women, rather than attempting to chemically eradicate entire personality types simply because they don’t gel with our artificial societal constructs? Walsh points to claims from the Centers for Disease Control that 50% of Americans will develop a mental disorder - which seems rather high and unreasonable - and to an article concerning the difficulty drug companies have in selling ADHD drugs in Europe. A few months ago, Psychology Today published an article with the title, "Why French Kids Don't Have ADHD." That's curious; American kids have ADHD, but not French kids? How can that be? In the United States, child psychiatrists consider ADHD to be a biological disorder with biological causes. The preferred treatment is also biological--psycho stimulant medications such as Ritalin and Adderall. French child psychiatrists, on the other hand, view ADHD as a medical condition that has psycho-social and situational causes. Instead of treating children's focusing and behavioral problems with drugs, French doctors prefer to look for the underlying issue that is causing the child distress—not in the child's brain but in the child's social context. They then choose to treat the underlying social context problem with psychotherapy or family counseling. This is a very different way of seeing things from the American tendency to attribute all symptoms to a biological dysfunction such as a chemical imbalance in the child's brain. You should read the rest. It seems a much more "human" approach to children - and realistic - than that now employed in the U.S.
Could it be that our kids are distracted because they’re surrounded by distractions? Could they be overstimulated because they’re surrounded by stimulation? Could they have trouble paying attention in school because school is tedious and boring? You cannot honestly raise children from the moment they're born (remember Baby Einstein?) with stimuli constantly around them and then put in a classroom with little stimuli and expect them to be content. It simply isn't fair. Some educators are seeking to remedy this today with the use of iPads and SmartBoards in the classroom, but I don't this will, in the end, be very helpful. It simply continues the constant stimuli without every helping a person acquire self-disciple (but this could be the introvert in me talking). There’s no question that some people — myself included — think and behave in a certain way; a way that currently falls under the “ADHD” umbrella. The question is this: are these people “disordered”? Do they need medicine? Is there something WRONG with how they are? Or should we help them explore and harness their different, complicated, wonderful minds? In the end, this is more of a philosophical question than a medical one. I know my answer. I encourage you to come up with your own. Many children diagnosed today with ADD or with ADHD are labeled as "special needs." Yes, they have special needs, as has every student because they have unique personalities. In my experience, these students often simply need to be challenged more. Challenge them and they'll rise to the occasion, if you let them work in their preferred way. But our cookie-cutter approach to education does not allow that. Update: Over at Facebook, a friend has strongly disagreed with this post because, to him, it seems that I have "dismiss[d] the entire thing wholesale"and see ADHD as "completely bogus." That certainly wasn't my intent. Because ADHD is a disorder of performance rather than ability, we expect to find variability across settings and tasks. That variability is instructive: "What about this task or this setting is such a good match for this individual? And how can we make other areas of his/her life more like that" [emphases original, both italics and bold]? Those two questions were really the heart of what I was getting at, which our current educational model simply cannot address. And because not every child simply fits into such a cookie-cutter approach, we do what's easiest and give them medication to fit in better. That I find disturbing. To be fair, the student I referenced above whom I allowed to pace back and forth was noticeably different when he did not take his prescribed ADHD medicine, but even without it he wasn't intolerable, just a bit more difficult. He hated taking his medicine because he knew it changed his personality and, naturally, he was not comfortable with that. Better to find the environment that works for an individual than to medicate. Yesterday His Holiness Pope Francis awarded the Ratzinger Prize to two theologians and spoke spontaneously on the great gift that his predecessor gave to the Church and to the world in his three-volume work Jesus of Nazareth. No one can measure the good he has done by means of this gift; only the Lord knows! But we all have a certain perception of this, having listened to so many people who, thanks to these books on Jesus of Nazareth, have nurtured and deepened their faith, or have indeed drawn close to Christ for the first time, as adults, bringing the demands of reason alongside their search for the face of God. I have often remarked that in the first 80 pages of the first of the three volumes, Pope Benedict offered enough until you're dead. If you want to know Jesus more intimately grab these books which Benedict XVI described as "my personal search 'for the face of the Lord.'" So valuable are these books that I made certain to bring them with me to Rome. You really should read them. Can only Christians be saved? Over at The New Liturgical Movement, Peter Kwasniewski raising some interesting questions regarding the formulation of the text of prayers for the dead as used in the universal prayer (which are also known as the General Intercessions, the Prayer of the Faithful, or the Petitions). It is desirable that there usually be such a form of prayer in Masses celebrated with the people, so that petitions may be offered for holy Church, for those who govern with authority over us, for those weighed down by various needs, for all humanity, and for the salvation of the whole world. d) for the local community. Nevertheless, in any particular celebration, such as a Confirmation, a Marriage, or at a Funeral, the series of intentions may be concerned more closely with the particular occasion (69-70). There are liturgical prayers for the dead, such as those found in the Order of Christians Funerals, but Mr. Kwasniewski primarily concerns himself with the universal prayer. Strictly speaking, though, the petition for the faithful departed is not required. Even so, I don't find this aspect of his argument troubling, but his claim that "those who are not Christian when they die cannot be saved" is simply not in accord with the teaching of the Church. Those also can attain to salvation who through no fault of their own do not know the Gospel of Christ or His Church, yet sincerely seek God and moved by grace strive by their deeds to do His will as it is known to them through the dictates of conscience. Nor does Divine Providence deny the helps necessary for salvation to those who, without blame on their part, have not yet arrived at an explicit knowledge of God and with His grace strive to live a good life (Lumen Gentium, 16). Basing itself on Scripture and Tradition, the Council teaches that the Church, a pilgrim now on earth, is necessary for salvation: the one Christ is the mediator and the way of salvation; he is present to us in his body which is the Church. He himself explicitly asserted the necessity of faith and Baptism, and thereby affirmed at the same time the necessity of the Church which men enter through Baptism as through a door.Hence they could not be saved who, knowing that the Catholic Church was founded as necessary by God through Christ, would refuse either to enter it or to remain in it (Lumen Gentium, 14). 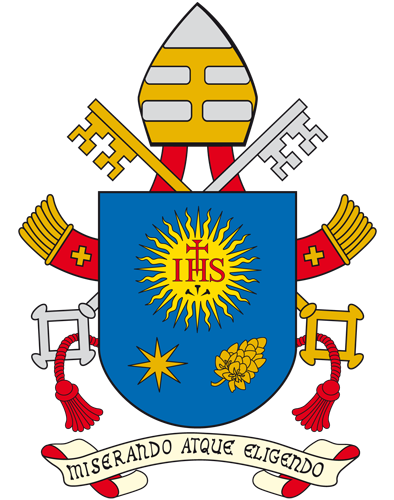 With respect to the way in which the salvific grace of God — which is always given by means of Christ in the Spirit and has a mysterious relationship to the Church — comes to individual non-Christians, the Second Vatican Council limited itself to the statement that God bestows it “in ways known to himself” (Ad Gentes, 7). Theologians are seeking to understand this question more fully. Their work is to be encouraged, since it is certainly useful for understanding better God's salvific plan and the ways in which it is accomplished. However, from what has been stated above about the mediation of Jesus Christ and the “unique and special relationship” (Redemptoris Missio, 18) which the Church has with the kingdom of God among men — which in substance is the universal kingdom of Christ the Saviour — it is clear that it would be contrary to the faith to consider the Church as one way of salvation alongside those constituted by the other religions, seen as complementary to the Church or substantially equivalent to her, even if these are said to be converging with the Church toward the eschatological kingdom of God (21). It is therefore possible for those who are not Christians when they die to be saved, although in ways known only to God. This does not, however, mean that Church should not evangelize the world; indeed, every Christian has a solemn duty to strive to lead others to Jesus Christ and bring them into the fold of the Church there to receive the fulness of the means of salvation. It's a dangerous business, Frodo, going out your door. You step into the Road, and if you don't keep your feet, there is no knowing where you might be swept off to (The Lord of the Rings, I.III). Often have I found these words true in my life, even when simply going out my door for a simple walk. Such was the case yesterday afternoon when I left the Casa Santa Maria to meet a good friend from Quincy and her companions who were touring Italy. I left a little later than I had intended and so was making my way through the crowds with some speed when a man called after me asking me how to get to Saint Peter's. I explained the route to him, but before I set off on my journey again, intending to keep my feet, (I always walk faster than the tourists and pilgrims), but he said something or I said something that sparked a conversation that quietly told me I should let myself be swept off (I cannot remember who it was or even what it was). He was in Rome only for a few days with his wife and sons and arrived only that morning. He was born in Greece and so was Greek Orthodox, but spent the last 61 years in Australia. He married an Australian woman, a Catholic, and his children were also Catholic, which made things difficult for him when he returned each year to Greece and his family did not speak Greek. At any rate, family custom dictated that he should have been named George, but when his father served in the army his comrade was killed and he was wounded. He prayed to God for safety and rescue, promising to name his first-born after the Saint on whose day it was on which he prayed. He was rescued and kept his promise (it's a Greek Saint whose name I never quite caught). The man's father died when he was 19 and, blaming God, he abandoned the Orthodox faith and God, but something was happening in his life in recent years that set him out on a journey in search of God. If my father had followed family custom, I should have also been named George and my father died just before my 8th birthday. I can't explain the bond that is felt by those who have lost a parent at a young age, but there is frequently an instantaneous understanding and friendship. I told him I was on my way to Saint Peter's and would be happy to accompany him there. As we walked, he asked many questions about God and about the Catholic faith and history, which I was glad to answer. The route which I know well has never taken so long or been so rewarding. When we arrived at the Angel Bridge, he thanked me for my time and for my help and asked me to continue on without him because, as he said, "I'm about to cry," so moved was he at the experience of being in Rome, at finding a Catholic priest seemingly by chance in the middle of the day taking the same route he was on and who shared some of his experience. He felt the hand of God at work and I was humbled to have been used by the Lord in such a simple way. This is the constant danger of living in the Eternal City, of taking it all for granted and getting too used to walking the streets where the early martyrs walked and shed their blood, of visiting their tombs, and walking to Saint Peter's every day simply for a little exercise and because I can. I met my friends about 30 minutes later than planned, but they didn't mind; they have just been seen Pope Francis again (they were at the Wednesday Audience two weeks ago) and enjoyed watching some of the workers dismantle a jumbotron. They were hungry so we decided to go to a quiet restaurant and visit. Besides, one of them who is not Catholic had lots of questions to ask. I had planned to take them to a nearby restaurant that Father Keyes recently introduced me to, but it is closed on Sundays. There are still a great number of people in the area of Saint Peters so finding a place to eat was not easy. Eventually I saw a place that looked as though it could accommodate the 8 of us, but it was a German restaurant (and prepared the meal for Pope Benedict XVI's 80th birthday, but I didn't know that until we left). That turned out to be providential, because my friend cannot eat acidic food (which makes most Italian a no-go) and German food is the favorite of one of the others. It was another opportunity to lose my feet. When a couple of hours together in the restaurant and then talked more in St. Peter's Square. As we left the Square, tears formed in many of their eyes as they looked again upon the Basilica and recalled they graces they received on their 3-week tour of Italy. It was another reminder that I cannot take my time here for granted. After a while, they accompanied me back on the route on I took with the Greek man and we stopped at a gelateria with the best pineapple gelato in Rome. Afterwards, we walked a bit more and then we parted ways. They began their return to the U.S. this morning. All in all, it was a great day of spiritual conversation with friends, for which I am grateful. From time to time the task falls to me to draft a text for the Universal Prayer, which is also often called the Prayer of the Faithful or the General Petitions. Whenever I do so, I seek to base the texts I write in the readings assigned for the Mass of the day, in the text of the proper prayers of the Mass, and sometimes on the life of the saint who is celebrated. Today I am to serve as the Master of Ceremonies during the Holy Mass offered here at the Casa Santa Maria, which today will be celebrated by a visiting Archbishop from the United States of America, word of which only came to the Masters of Ceremonies last evening. In preparation for the Mass, it seemed prudent to prepare a text for the Universal Prayer in case one had not been prepared (I'm not certain if this task is assigned to anyone in particular); it is better to have a prepared text and not use it than to not have a prepared text and need one. Confident that the Lord hears the cry of the poor, let us call out to him in our need (cf. Psalm 34:7). For the Christian faithful: may they never refrain from proclaiming the truth of the Gospel out of fear or apathy, let us pray to the Lord (cf. II Timothy 4:16-17). For those who govern nations, states, and cities: may they look to the God of justice and be inspired to assist the weak and the oppressed, let us pray to the Lord (cf. Sirach 35:15-16). For the Day for the Family: may engaged couples, husbands and wives, children and parents, seek in their daily lives to reflect always the love of Jesus Christ, let us pray to the Lord. For each of us: may we continually turn to God, humbly seeking his mercy, and so share what we receive in joyful love, let us pray to the Lord (cf. Luke 18:13). For those who feel so crushed by the hardships of life that they wish to end it: may the nearness of the love of God comfort them and strengthen their hope. Let us pray to the Lord (from Pope Francis' prayer intentions for October 2013). For the faithful departed: may he who redeemed the lives of his servants bring them swiftly into the glory of his presence, let us pray to the Lord (cf. Psalm 34:23, 3). and bring us safely to the heavenly kingdom (cf. II Timothy 4:18). If you might find them useful at this late hour, feel free to use them. Rev. Daren J. Zehnle, J.C.L., K.C.H.S. Father Daren J. Zehnle, J.C.L., K.C.H.S., a priest of the Diocese of Springfield in Illinois, serves as Pastor of St. Augustine Parish, Ashland; Director of the Office for Divine Worship and the Catechumenate; Adjutant Judicial Vicar; and as Diocesan Judge for the Diocesan Tribunal. Man's best friend is ... a person? What is it that guides us? Egidio Flamini's "Nella Tomba di San Francesco"